Marijuana has been extensively covered in the news recently, both nationally, as well as here in Pennsylvania. Currently, nine states (Washington, Oregon, California, Nevada, Colorado, Alaska, Maine, Vermont and Massachusetts) have legalized the recreational use of marijuana for adults 21 years of age and older. Sales of medical marijuana in the U.S. were estimated to be around $3 billion in 2017 and are expected to rise.1 States like Pennsylvania (and 28 others, as of current date) have legalized the use of marijuana for medical reasons, with different guidelines in each jurisdiction. February 15th, 2018, marked the opening of the Commonwealth’s first medical marijuana dispensary. In an effort to ease public confusion, it is important to understand the legalities around these dispensaries and the patient process of receiving medical marijuana. Notably, this article is not a discussion of the pros/cons of marijuana. The first question that comes to many people’s minds is, “Is medical marijuana really legal?”. The answer is a bit nuanced. In Pennsylvania, the Medical Marijuana Program (Act 16 of 2016) was signed into law in on April 17th, 2016, but from the federal perspective, marijuana is still technically illegal, with prohibition stemming back approximately 80 years. Therefore, in the Commonwealth, patients possessing and using medical marijuana, as well as the prescribing doctor, grower and dispensers run the risk of federal civil and criminal penalties. The outcomes and implications of the Pennsylvania Medical Marijuana Program remain to be seen, but more information will emerge over time. As the program is somewhat specialized and still new, not all regular medical providers may have detailed information readily available. In the meantime, please refer to the frequently asked questions, further information, and contact information available at pa.gov. Statista. Medical marijuana retail sales for the U.S. from 2013 to 2021 (in billion U.S. dollars). https://www.statista.com/statistics/596631/us-medical-marijuana-retail-sales-estimates/. Accessed March 21, 2018. Commonwealth of Pennsylvania. Pennsylvania Medical Marijuana Program. https://www.pa.gov/guides/pennsylvania-medical-marijuana-program/. Accessed January 26, 2018. Penn Live. More than 10,000 patients register for medical marijuana in PA. http://www.pennlive.com/politics/index.ssf/2017/12/more_than_10000_patients_regis.html. Accessed February 20, 2018. This article was written by Thomas Handerhan, a student pharmacist at Duquesne University School of Pharmacy, and reviewed by his faculty advisor, Dr. Jordan Covvey. 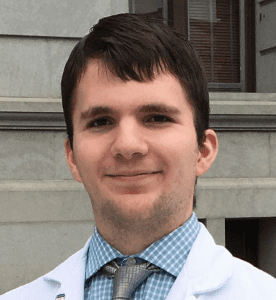 Thomas is currently a fifth year pharmacy student and works as an intern at Children’s Hospital of Pittsburgh, UPMC. He is an active member of the professional pharmacy fraternity Phi Delta Chi, the American Pharmacist Association (APhA), and the Emerging Leaders Committee of the Juvenile Diabetes Research Foundation. After graduation, Thomas would like to pursue a clinical pharmacy residency and practice in an acute care setting. Dr. Covvey is an Assistant Professor in Pharmacy Administration at the Duquesne University School of Pharmacy. She earned her Doctor of Pharmacy from the University of Kentucky in 2010, and then completed residency training at Virginia Commonwealth University Health System in 2011. She subsequently passed her board certification in pharmacotherapy (BCPS) and was selected as a recipient of a Fulbright grant to complete a Doctor of Philosophy at the University of Strathclyde Institute of Pharmacy and Biomedical Sciences in Scotland. She currently teaches in the public and global health curriculum for pharmacy students at Duquesne, and her research area is in the utilization of healthcare data, such as electronic medical records, for quality improvement in prescribing. Previous articleMeasles, Mumps, Rubella—Oh My!